Polyester tablecloths have become quite popular in the recent times owing to their low cost and linen-like exquisiteness. Along with offering sheer beauty, the durability, stain-resistance and low-maintenance of these tablecloths make them a preferable choice for event and venue decorators. Specific to provide a color-coordinated presentation, you can use polyester tablecloths for weddings, anniversaries, and any other type of occasions and settings. 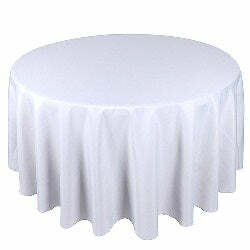 We, at BB Crafts, store and offers a wide collection of polyester round tablecloths, made from finest made polyester fabric. The extensive range of poly table linen is available in varied color and size choices, to perfectly fit the need of different clients. Offering feature-finished edges, seamless table setting, easy-to-care option, the round polyester tablecloths are available at affordable prices.